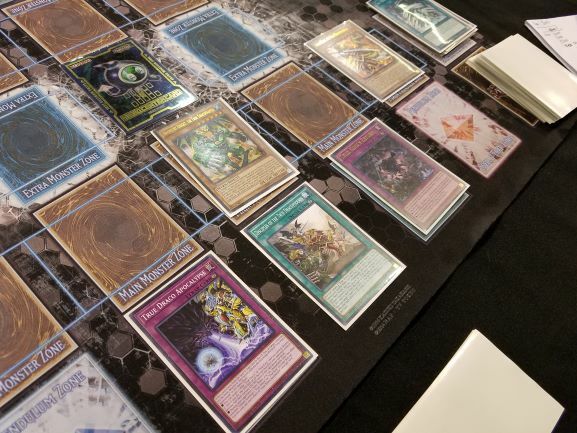 We’re at the halfway point of Day 1 here at YCS Chicago! 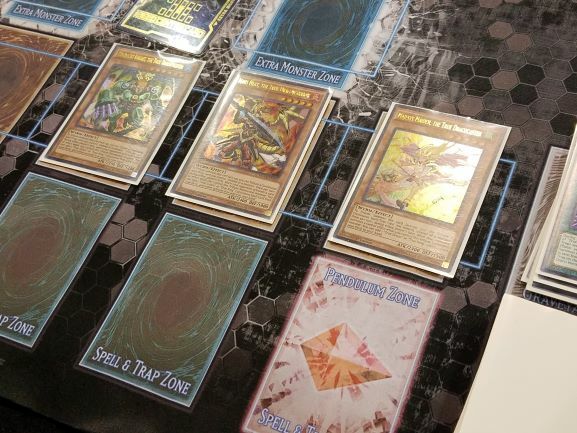 We have a New York Duelist, Jerry Borbon, playing a Noble Knight Deck! Although we’ve seen Isolde, Two Tales of the Noble Knights in many strategies, it’s at its best in a dedicated Noble Knight build! He’s up against Benjamin Deeter from Iowa, using True Draco! The True Draco strategy typically plays a lot of floodgate cards that could make things rough for the Noble Knights but may have trouble if Borbon gets going too quickly. Read on to see how it goes! Borbon had Noble Arms – Caliburn, two Noble Knight Brothers, Until Noble Arms are Needed Again, and Called by the Grave. He played Brothers and Special Summoned the second Brothers, using both to play Isolde, Two Tales of the Noble Knights. Isolde added Noble Knight Medraut to his hand. He then used Isolde’s second effect to send Noble Arms of Destiny, Noble Arms – Gallatin, Noble Arms – Clarent, and Noble Arms – Excaliburn to the Graveyard to Special Summon his third Brothers from the Deck. He used the effect of Brothers to return his first two Brothers and Clarent to the Deck and draw Effect Veiler. He equipped Isolde with Caliburn and gained 500 Life Points, and Set Called by the Grave and Until Noble Arms are Needed Again. In Deeter’s Standby Phase, Borbon flipped Until Noble Arms are Needed Again, revealing another Effect Veiler and adding it to his hand. Deeter played Pot of Duality, revealing Majesty Maiden, the True Dracocaster; Ignis Heat, the True Dracowarrior; and There Can Be Only One. He added Majesty Maiden to his hand. Terraforming came next, getting Dragonic Diagram, and he activated it. He Set True Draco Heritage and destroyed it with Diagram, getting another Heritage. The destroyed Heritage then destroyed the Set Called by the Grave. Deeter Set True Draco Apocalypse and Tributed it to play Majesty Maiden, and Apocalypse destroyed the Brothers. He played Heritage to draw two cards. Majesty Maiden attacked and destroyed Isolde in battle. Deeter Set three back row cards to finish. Borbon drew Noble Arms – Arfeudutyr. He played Medraut and equipped it with Arfeudutyr, and Deeter Chained Majesty Maiden, then Chained There Can Be Only One! Borbon Chained Until Noble Arms are Needed Again from his Graveyard, and Special Summoned Brothers from his Deck. He could now only control one Warrior, and sent Medraut to the Graveyard. Majesty Maiden added Dinomight Knight, the True Dracofighter to Deeter’s hand. Arfeudutyr reequipped to the Brothers, and Deeter flipped up True King’s Return before it could be destroyed. Borbon used the Brothers to return three cards to the Deck, looking for an answer to There Can Be Only One. He drew Medraut. He used Arfeudutyr’s effect and destroyed a second Set copy of There Can Be Only One. Deeter used Diagram to destroy True King’s Return, which destroyed Brothers. He played Disciples, returning three cards to the Deck to draw a new one. Heritage let him draw another card. Pot of Duality was next, adding another Dragonic Diagram to his hand. He played it, destroying There Can Be Only One to get Ignis Heat, the True Dracowarrior. He Tributed Disciples and Heritage to play Ignis Heat and Dinomight Knight. He sent his monsters to attack and wiped out Borbon’s Life Points! The Duelists moved to their Side Decks. Borbon would need to find an answer to cards like There Can Be Only One, which can completely shut down a Deck like his. Deeter might even side in even more cards like those. Borbon began with a hand of Clarent, Ash Blossom & Joyous Spring, Ghost Ogre & Snow Rabbit, Reinforcement of the Army, and Arfeudutyr. He started with Reinforcement of the Army to get Medraut, playing it equipped with Clarent. Medraut Special Summoned Noble Knight Iyvanne. Clarent was destroyed and reequipped to Iyvanne, which Special Summoned a Noble Knight Token. He used Iyvanne and the token to play Isolde, Two Tales of the Noble Knights, adding another Medraut to his hand. Isolde then sent Noble Arms of Destiny, Excaliburn, Caliburn, and Gallatin to the Graveyard to Special Summon Brothers. Brothers returned Iyvanne, Clarent, and Caliburn to the Deck to let Borbon draw Noble Knight Gawayn. He used Medraut and Brothers to play Artorigus, King of the Noble Knights! It equipped itself with Excaliburn, Gallatin, and Noble Arms of Destiny! Deeter began with Terraforming to get Dragonic Diagram, then Upstart Goblin. He laughed when he drew his card, and moved to his Battle Phase to play Evenly Matched! Borbon banished everything but his Isolde. Deeter Set a card in his back row, and activated Diagram. He tried using Diagram but lost it to Ghost Ogre. Deeter Tributed the Set Apocalypse for Ignis Heat and Set his last two cards in his back row. The Apocalypse destroyed Isolde. Borbon drew Iyvanne. He played Medraut and equipped it with Arfeudutyr. Ignis Heat’s effect activated, and Deeter Chained There Can Be Only One and flipped up True King’s Return. He searched out Disciples with Ignis Heat. Borbon was unable to use Medraut or Arfeudutyr now, and simply passed his turn. Ignis Heat destroyed Medraut in battle. Borbon drew Morgan, the Enchantress of Avalon. He Set Gawayn. Ignis Heat destroyed Gawayn, and Deeter Set a back row card. Borbon drew Ash Blossom & Joyous Spring and Set it. Ignis Heat destroyed it and Deeter Set a card in his back row again. Borbon drew Twin Twisters! This could be his answer, but he passed for now. Borbon drew Clarent. He activated Twin Twisters, discarding Ash Blossom to destroy There Can Be Only One and a Set True Draco Apocalypse… and Deeter flipped up another There Can Be Only One! Ignis Heat attacked directly again, leaving Borbon with 3500 Life Points. Deeter Set two back row cards. Borbon drew Noble Knight Custennin Set and Iyvanne. Borbon drew Noble Arms of Destiny. He Set Custennin. Borbon drew Medraut and Set Morgan. Borbon drew Until Noble Arms are Needed Again. He played Medraut and equipped it with Noble Arms of Destiny and Clarent. He paid 500 Life Points for Clarent, attacked directly, and Set his Trap Card. Deeter flipped Apocalypse, destroying Ignis Heat to cut Medraut’s ATK in half. He Tributed There Can Be Only One to play Dinomight Knight, then played Disciples to return three cards to his Deck and draw one. He played The Monarchs Stormforth, and Borbon flipped Until Noble Arms are Needed Again, desperate for an answer… he added Iyvanne to his hand. Deeter got another Apocalypse with Dinomight. Deeter then Tributed Medraut to play Ignis Heat – Borbon had nothing to defend with! Benjamin Deeter wins with True Draco! YCS Chicago: Round 6 Pairings Check Out These New Duel Links Prize Pins!